Our bodies change during pregnancy and it can have some effect on our feet. It is important to keep our feet happy during pregnancy to avoid any pain or discomfort. Massage your feet to help reduce discomfort or come in for our ‘Relief for Pregnant Feet‘ treatment and our podiatrists will take care of you. 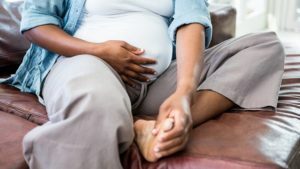 If you are wishing for some advice on your feet during your pregnancy, wanting to get the ‘Relief for Pregnant Feet‘ treatment or to get your nails professionally trimmed, don’t hesitate to book in to see one of our podiatrists.